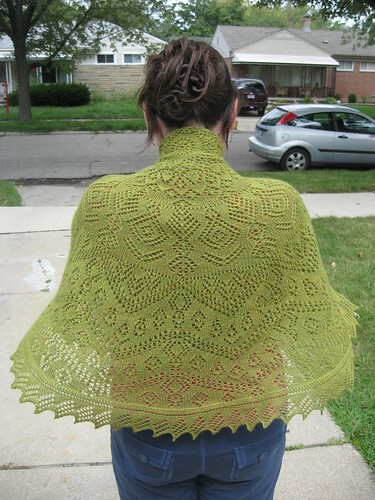 Last Summer I joined a mystery Kal for a round shawl. I even started a bit late but was able to catch up and be on the fourth clue when everyone else was. The fourth clue ruined everything. I should explain that each clue had four “clues” within it so you were kinda designing the shawl yourself as you went along. 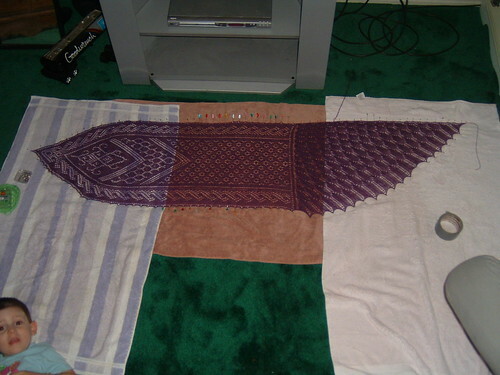 Not every-ones shawl would be the same depending on whether you picked chart A,B,C or D within each clue. Well within Clue 4 I think B and D were 98 rows and A and C were only 50 rows. 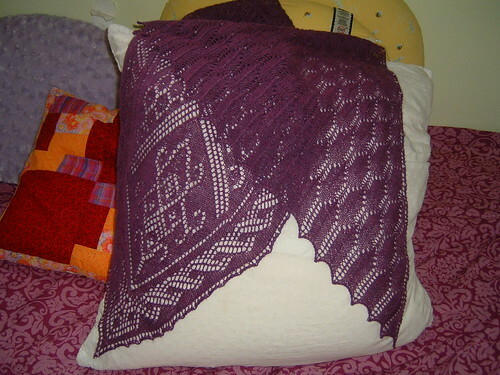 Well of course I liked D and I was worried if I did one of the shorter ones my shawl wouldn’t be big enough. So that was 98 rows times 576 stitches per row. 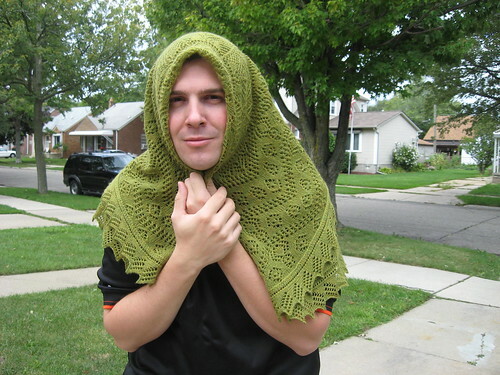 I got tired of the shawl pretty quick and right around the same time last Fall my grandma was visiting so i couldn’t work on. I need 100% focus! I picked right back up after she left but those rows were taking me painfully long and i kinda gave up on it. I had lost my will and I wasn’t having fun anymore. Christmas was coming and then all my eye troubles came and come the new year I still wanted nothing to do with the shawl. I DID IT! She is done and I couldn’t be happier. 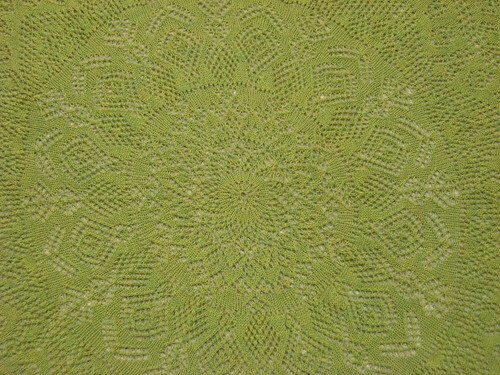 Yarn: Knit Picks Shadow in Spring Green. Just a teeny bit over 3 balls!! Notes: Wonderful Pattern. I love that you are part of the design process by picking which chart you will do within each clue. I did: Clue 1-Chart A, Clue 2-Chart A, Clue 3-Chart A and Clue 4 Chart D. There is only one edging to chose from for the fifth clue. I did run out of yarn when I was doing the edging, so close to the end. Very frustrating but I kinda saw it coming when I saw my yarn dwindling down to nothing. The yarn came quickly and you can’t even tell it’s not the same dye lot. I am so happy that it is done. I am still not sure what I will do with it. I was thinking about putting it on my table. Or letting it keep me cozy. stole on pillow, originally uploaded by Craftydiddl. Since i was so happy to be free of my stole you would think that would be the last you would hear of it but i love it so much that i took more pictures once it was done blocking. If you want to see more they are here! MS3 blocking, originally uploaded by Craftydiddl. Free of knitting on the Mystery Stole! It is blocking but i have a feeling i will have to block it again. 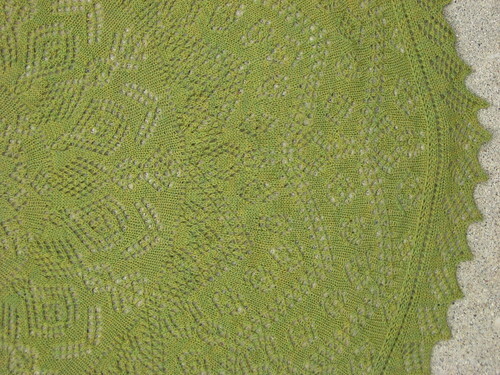 This is my first time ever blocking lace or anything of this size. i don’t think i stretched it enough lengthwise. I felt like i with every readjustment i would make it would make it worse and find spots that needed to be stretched more. I love it though. 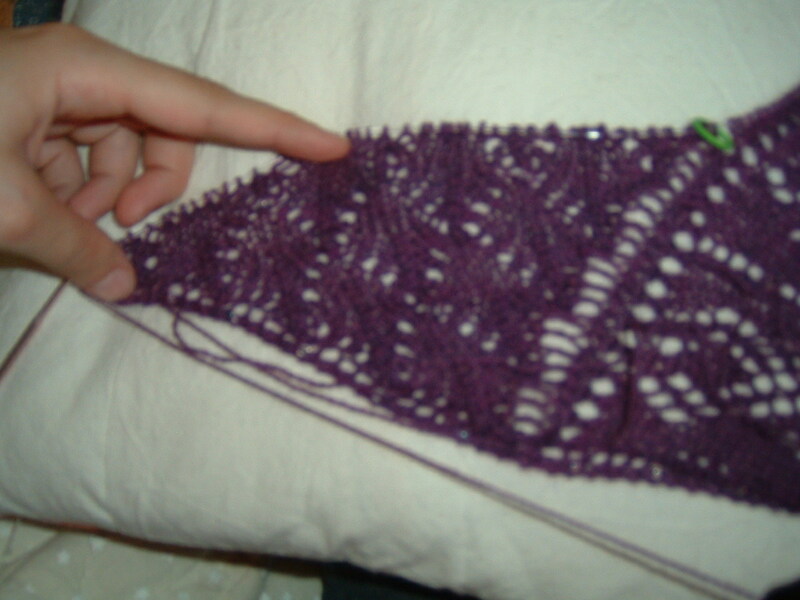 i am not sure how much use it will get but i am so proud of my first lace pattern with lace yarn. It was a great pattern and i had a lot of fun watching it unfold and having no idea what the end result would be. i do have to admit the last 2 weeks really went slow. i wanted so badly to just push the stole aside and not work on it for a long time LOL. I am glad i kept with it because who knows how long it might have been on the back burner. Yarn: Knit Picks Shadow in Grape Jelly from the stash. i did do the stole with beads. nothing special just some clear an shiny beads from th local craft store. 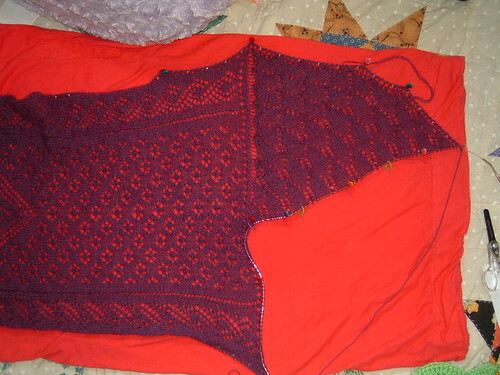 Now time to start the second Monkey and swatching for a top-down cardigan using this pattern. i need something just easy to work on for a little bit. 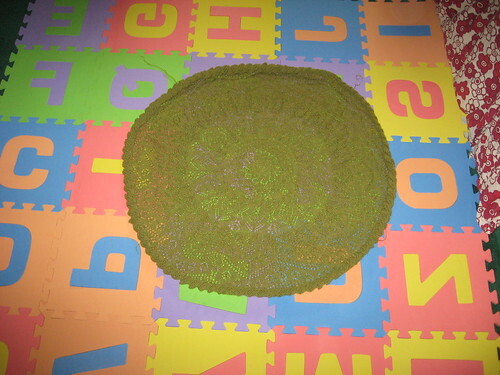 And my Omi requested another washcloth so i need to start that too! If that’s not enough, i finally bought some cream colored fabric that i will use to practice some embroidery stitches on and turn it into a booklet of the the stitches as i learn them. 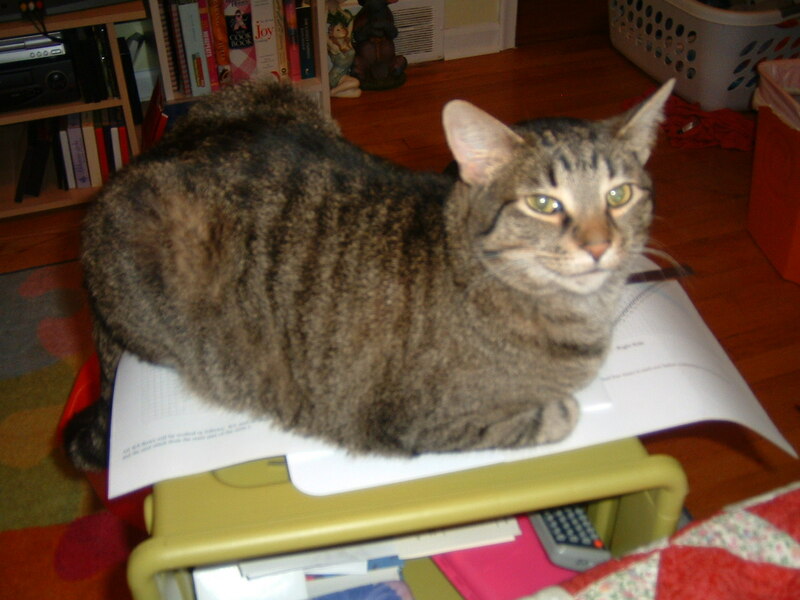 A little hard to knit when Max decides he likes your little table with your pattern chart on it. Everytime i leaned back to work on the Wrong Side row he made himself comfy on the pattern. He may have slowed me down last night. . . But i still got it done. 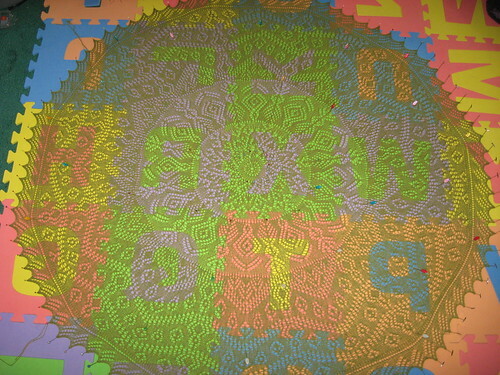 MS3 Clue 6 finished, originally uploaded by Craftydiddl. Tomorrow the last clue comes out. 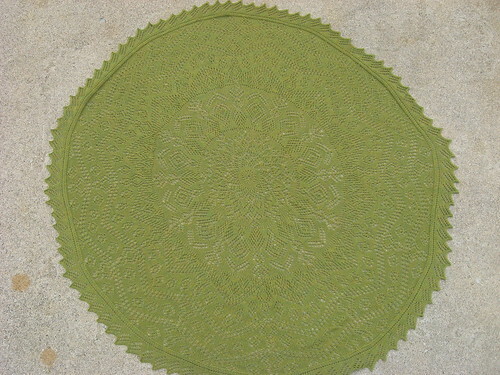 I will be so happy when i am done with the Stole-Now i have to figure out How and Where i am gonna block this baby! Mystery Stole Clue 5, originally uploaded by Craftydiddl. Two more to go, I think. This part was fine-i kinda missed having the center stitch to know where i was and help me figure out if i was on the right track. Instead i kept track by putting a stitch marker at the beginning and end of the repeated section and that really helped. I liked this pattern because it was also pretty easy to tell when you messed up. The double decreases and yarnovers made lines so you could tell from the row below if you were off. I only missed one yarnover in this section. Don’t get me wrong there were other flubs but i caught them before i had moved on to the next row. I am glad i finished this during Little Man’s nap so i can work on my Monkey’s tonight. I know i really should be working on my Pinwheel Purse but i just haven’t been drawn to that project at all. 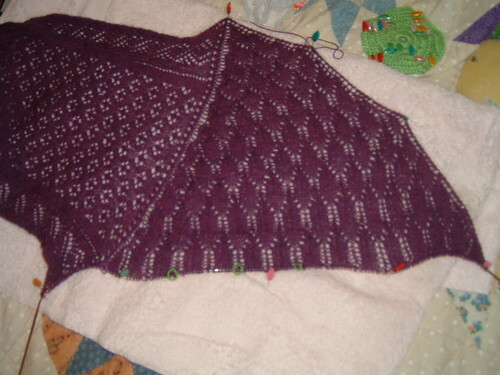 I might at least try to finish my last triangle tonight so that way the back piece is done. I have decided that i really need to try and eat better and work on my weight. Every night for the past few weeks i have been laying Little Man down and just chowing on all the junk that i won’t let him eat. (hypocrite, i know) i just crave sweets. I have to have chocolate or cake or ice cream. I haven’t put on any weight but i just know that eating late at night is not good for my body and of course isn’t helping me lose the original weight i have been wanting to lose since Little Man was born. I want to try and eat more veggies and satisfy my sweet cravings with fruit or a teeny treat. I love to bake but most of the time i am the one that eats the whole cake over a week because hubby is more of a salty snacker. So i am going to freeze half or more of the cake so that way there isn’t any out to tempt me. Smaller Portions of course. Anyone have any other tips or ideas? Understand this isn’t just a vanity thing (yes i am admiting it’s part vanity) but it is for overall better body health. i am still doing a lot of investigating and finding some recipes that will benefit the whole family not just me. Now just to let you know i hate anything from the water so that can make this a bit tricky. I know fish and such is supposed to be great for your health but i just can’t do it-i have tried. So i am sorry if you were gonna say “Eat Fish” that just won’t work for me. I really just want this to be a nice laid back, baby steps kind of thing. Explore what works for me. Well now that i have bored you with my eating plans i guess i will end and go knit some Monkey’s. Knitting burns calories 🙂 Just Playing, I am not anywhere near obsessive lke that. P.s. Karen asked me about my yarn for the Monkey’s so i figured i better put it on here. I didn’t even think to yesterday. It’s Lana Grossa Meilenweit 100 Multieffekt # 3124. (Karen i didn’t tell you the 100 because there is no 100 on my label but i guss that’s how they refer to it) It’s supposed to be one of those yarns that look like Fair Isle but aren’t. My Omi sent it to me from Germany before i was really into knitting socks. I gave in…, originally uploaded by Craftydiddl. Other than that i am still chuggin away on Mystery Stole Clue 5. I am not sure what it is but i am not moving along as quickly on this clue as i would like. 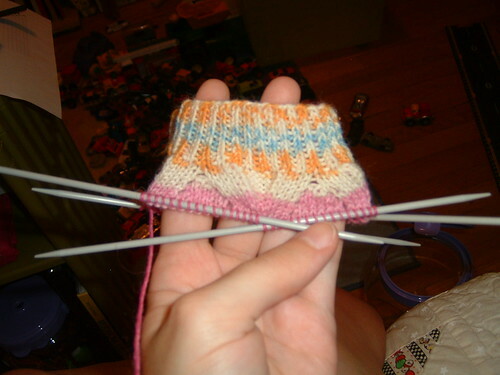 i do about 5 rows and then i want to quit and do something else but i force myself to do more. I still have 15 more rows to go. i think i am getting burnt out. LOL It’s just that usually when i have a bigger project on the needles i take breaks and work on something on the side. I know i could with this too but i set myself a goal of getting the clues done each week and i really want to stick with it! 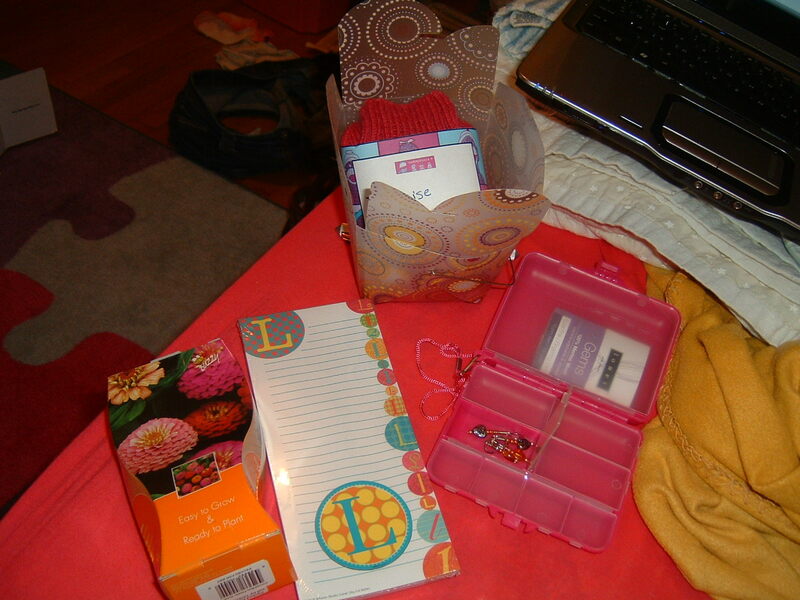 Her socks inside one of those plastic chinese takeout style boxes, some Zinneas, a magnet and a memopad with her initial on it and a storage case with some stitch markers. I also added a leather bookmark that has a spot for a picture after taking this shot. I have one of those storage cases and it is super handy-i have stitch markers, measuring tape, darning needles, fold-up scissors, stitch counter and a crochet hook for dropped stitches in mine. It is so much neater than my makeup case that i was using before so i thought maybe my pal might like it too for this or some other storage 🙂 I hope she likes her package, most of all her socks and that they fit properly! Today has been a pretty laid back day. I even slept in a little, that was nice. Before lunch i finally(!!!) 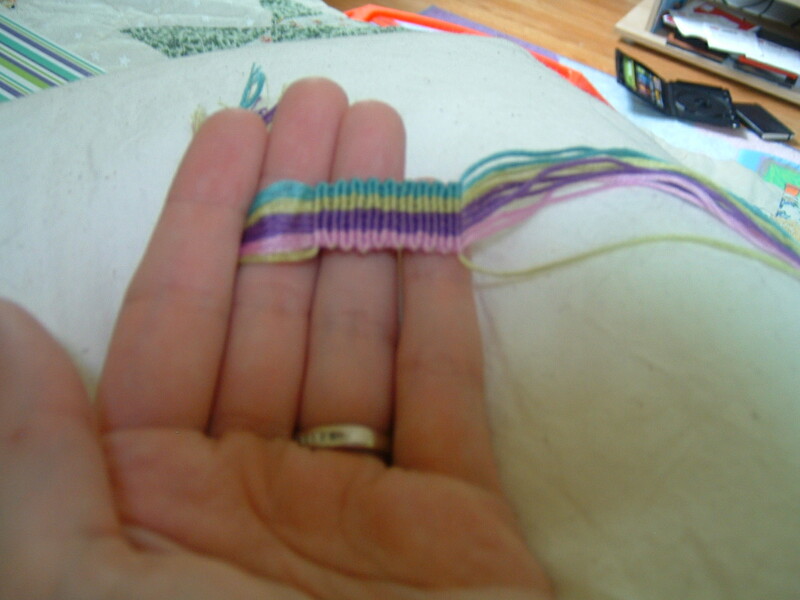 started a friendship bracelet from the Japanese Book i ordered a few weeks ago, Misanga Promise Ring. It was a bit tricky at first and i am still getting used to the knotting that they do. It’s basically backwards to what i learned when i was a little girl but it makes a beautiful pattern on the front and back so it doesn’t matter which way you wear it and i really like that. I also love learning something new and it has been fun so far. I had a bit of trouble photographing my progress but i hope you can kinda get the idea. I also worked on my Stole last night an today during Little Man’s nap. I finished up chart G and only had to back track one time because i forgot a yarn-over on row 47. So thing’s are going along pretty well. It’s almost ice cream time-Yum 🙂 Hope you all are having a good Saturday! I have been really wanting to bake something lately. I don’t bake as much in the summer because with the oven on my kitchen is 100 degrees but tomorrow i am going to make my grandma’s apple cake but with pears. Hope it’s good with pears i have mostly made it with apples and one time I tried necterines but hubby didn’t like that one as much as i did. I’ll let you all know how it turned out and take a picture too!